Sandra Dorning loved to spend time on the Oregon coast as a child, whale watching and exploring the tide pools. When she was 11 years old, she saw something that affected her deeply. Each year, the Marshall Scholarship offers up to 40 young Americans the opportunity to pursue graduate degrees for free at any university in the U.K. In the 2016 competition, only 3.5 percent of applicants were selected, and 25 percent of them were Ivy League graduates. Before Dorning, the UO’s last winner was in 2011. Dorning graduated from the UO in spring 2017 with a degree in marine biology. After graduating, she worked first as a summer intern and now as a research technician in the biology lab of UO professor Kelly Sutherland. She is interested in international marine policy related to fisheries management. Throughout her years as an undergraduate, Dorning had a variety of research experiences. During her senior year, she was editor-in-chief for the Oregon Undergraduate Research Journal. 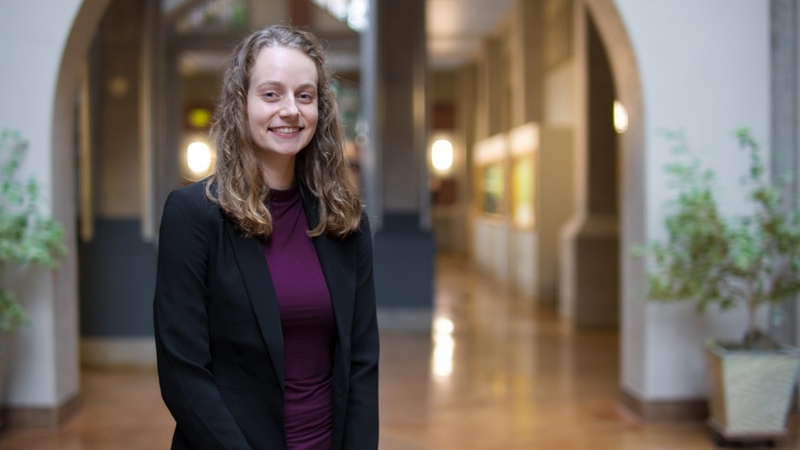 Her thesis for the Clark Honors College involved researching methods to mitigate the spread of an invasive species of sea squirt in Oregon’s Coos Estuary. As a winner of another distinguished scholarship, the National Oceanic and Atmospheric Administration’s Ernest Hollings Scholarship, she studied the acoustic behavior of Omura’s whales off the coast of Madagascar. Ultimately, Dorning’s undergraduate experiences lead her to discover her true passion in international marine policy. If she gets her first choice, Dorning will spend a year studying at the University of Saint Andrews in Fife, Scotland, and a year at the London School of Economics and Political Sciences. She believes that studying abroad in the U.K., particularly, will complement her career in international marine policy. For their help through the application process, Dorning is grateful to her thesis advisor, Craig Young; her political science professor, Ronald Mitchell; her advisor for the Oregon Undergraduate Research Journal, Barbara Jenkins; her current research advisor, professor Kelly Sutherland; and the director of the Office of Distinguished Scholarships, Josh Snodgrass. She offered up advice for any UO students considering applying for distinguished scholarships. “Even if you’re not sure whether you’ll be competitive, I think it’s important to just apply,” she said. “When I applied for this, I wasn’t holding my breath because I knew it was a competitive scholarship, but you never know what the scholarship committees are looking for and how your unique set of experiences may help you get that award.